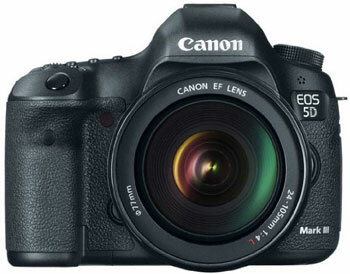 With the Help of ML Latest Hack the Canon 5D Mark III Records 4K Video and now you can use Silent Shutter too. When Magic Lantern announced that Canon 5D Mark III can record 4K videos on April 1 2017 we have decided not to published and to wait for further confirmations. But recently we got confirmation from our subscribers and users that Magic Lantern firmware is actually working and it allow Canon 5D Mark III to record high resolution video. Kudos to magic Lantern team for doing such a great work, it shows up the unused potential of the 5D Mk3 camera. Now let me tell you some insights of Canon 5D Mark 3 camera. If you use Lexar 64GB Professional 1066x CompactFlash Memory Card (UDMA 7) card in Canon 5D Mark 3 camera then you will get write speed of 95.3 megabytes per second which is quite fast but not sufficient if you wish to record a 4K video. Even if you use SanDisk Pro 64GB card then you will get exactly the same write speed. Hence the Write Speed of the camera limiting it to record 4K videos, despite of the ML team successfully recorded 4K videos from the camera for few seconds and even you can try it too. Recording limit of Canon 5D Mark 3 camera. The physical hardware as well as the software of the camera limit the write max speed 100MB/s, which will not allow for 4K@ 24fps to be recorded on the camera. If you force FullHD recording camera to record 4K or 3K video you may face Overheating due to overuse of hardware resources. Full-resolution LiveView: 5796×3870 at 7.4 fps (128ms rolling shutter). Did you know the name of world most used camera ? Explorecam knows it, the website Can actually pulls out all the meta data from the photographs that you capture and upload on the photo sharing websites like flickr 500px, pixway and via metadata of the uploaded image it actually finds out the most used camera, lenses and settings. 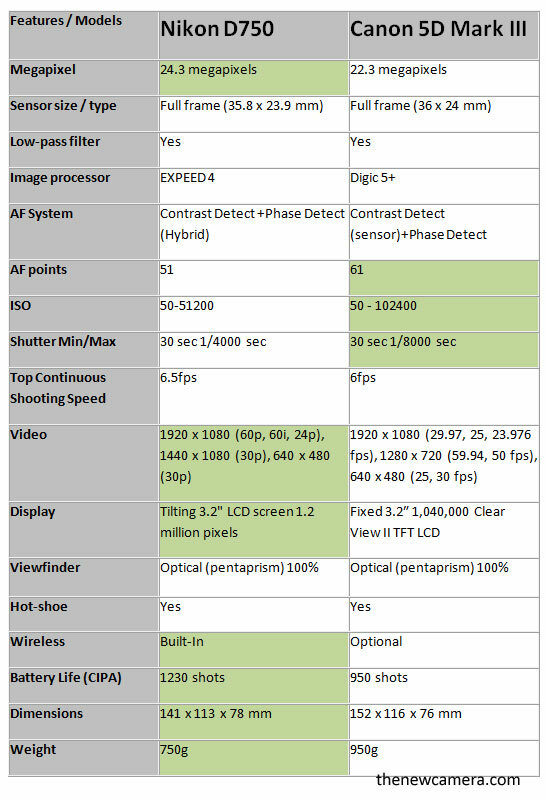 Take a look at the comparison between recently announce Sony A7 II Mirrorless camera and waiting to be updated Canon 5D Mark III DSLR. 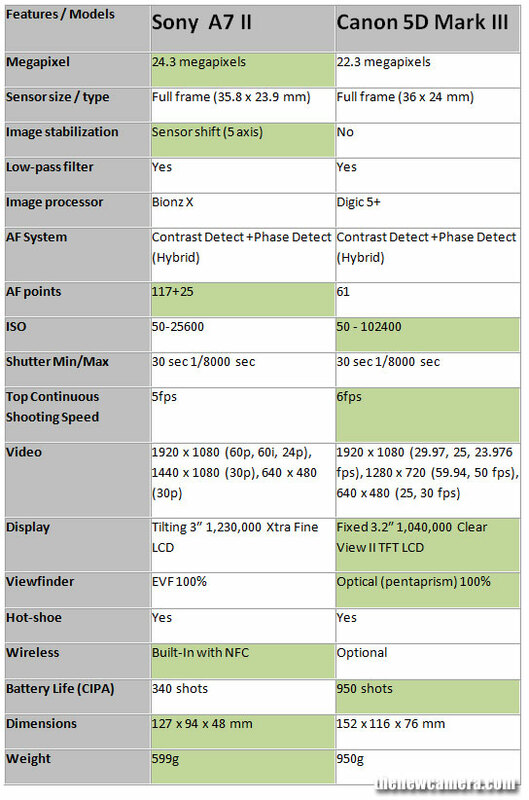 The recently announced Sony uses a Hybrid AF CMOS sensor that fabricated with 117 Phase AF points inside it, the camera also features additional 25 contrast based AF points, on the other hand the Canon 5D Mark II uses a additional AF sensor with 61-point autofocus points and 41 cross-type AF points (with f/4 lens support) and 5 dual diagonal AF points (with f/2.8 sensitivity). The 5D Mark III phase AF system is active only when you are using viewfinder, when you are recording videos or using live view display unit the contrast AF system gets activated and phase AF system gets deactivated. Sony A7 II HYBRID AF system is always active weather you are using a viewfinder, display unit for shooting your fav composition or when you are recording videos. We recommend you to get Sony A7II is you are a sports shooter. The Low light sensitivity of Sony A7 II is limited to -1EV and Canon 5D Mark III supports lowlight sensitivity upto -2EV, the other major advantage of Canon 5D Mark III is High ISO range compared to (25600 vs 102400), so best camera for available / low-light is Canon 5D Mark III. The 5-Axis SteadyShot INSIDE Stabilization, This compensates for five types of camera shake encountered during handheld shooting of still images and video, No sensor shift IS available in 5D Mark III. Both the camera records Full HD videos, but the Canon 5D Mark III Full HD is limited to 30fps and Sony A7 II can record Full HD videos at 60 fps. The Sony A7 II offers advance AF system and built in image stabilization compared to the 5D Mark III, so we recommend you to go with Sony A7 II based on specification comparison review. We’re having some great deals on the Canon EOS 6D camera Bundles! These are the lowest prices the 6D has ever been at from an authorized dealer! Nikon D5200 deals + WU-1a Mobile Adapter of $45.95 value! Nikon is giving you bit more resolution, but I am amazed that Nikon took 2+ years to develop a 5D mark III rival and still the AF system of the recently announced Nikon D750 is inferior to 5D Mark III. Nikon D750 -> 51 distinct points available, you get options to use 9, 21, or all 51 points depending on the situation. Canon 5D Mark III -> 61-point autofocus system with upto 41 cross-type AF points (with f/4 lens support) and 5 dual diagonal AF points (with f/2.8 sensitivity). The ISO range of Nikon D750 is also limited to 51200 only on the other hand the 5D Mark III ISO range touches 102400 mark, hence no doubt that the 5D Mark III will perform better in low light condition when compared to Nikon D750. and finally the verdict, the Canon 5D Mark III gives you advance AF system, more ISO range and based on specification comparison review we recommend you to buy 5D Mk 3.